This is a Sponsored post written by me on behalf of Pompeian for SocialSpark. All opinions are 100% mine. Grilled shrimp is layered over quinoa, fresh veggies and olive oil red wine vinaigrette! #DressingItUp with Pompeian red wine vinegar creates a refreshing salad everyone will love! Quiona salads have become my go-to meal for lunch. They are quick, easy and full of fresh fruits and vegetables. You can make them as light or heavy as you want. I like adding a little protein, like shrimp or chicken too. Mediterranean Grilled Shrimp Quinoa Salad is full of fresh vegetables and is bursting with flavor. And now that the weather is warmer, it is perfect for grilling. Olive oil and red wine vinegar are two of the most versatile items that you can have in your pantry. 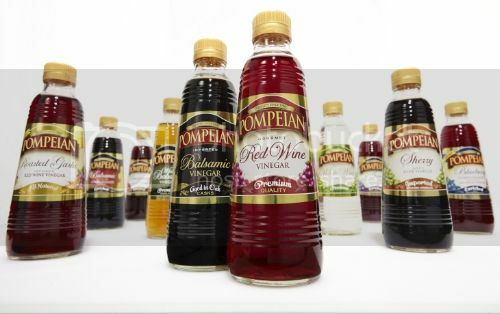 I love using Pompeian Red Wine Vinegar because it is a great way to add flavor to a fresh salad. The quality is excellent and the vinegar creates a dressing full of a unique and distinct flavor. In celebration of National Salad Month and National Vinegar Month, I am dressing it up with olive oil, red wine vinegar and a little bit of lemon juice. The vinaigrette and other flavors combine to create a dish that is refreshing and perfect for summer. Combine all the ingredients for the shrimp in a large bowl and marinate in the fridge for 20 minutes. Heat grill to medium-high. Remove shrimp from marinade and cook until opaque and cooked through, about 2 to 3 minutes per side. In a large bowl combine quinoa, cucumber, tomatoes, parsley, feta cheese, and garbanzo beans. In a small bowl, whisk together olive oil, red wine vinegar and lemon juice. Pour vinaigrette over salad and toss well to combine. Add salt and pepper, to taste. Layer shrimp over salad. Garnish with avocado and serve. Totally agree - olive oil and red wine vinegar are my go-to for dressings! This looks awesome - I love salads like this for lunch or for dinner, especially during the warmer weather! Ashley, what a delicious recipe using the red wine vinegar! Pompeian happens to be my most favorite brand! I had to pin this one, because the fam would really love this! Thanks, Gloria! I hope that your family loves it! Quinoa salads are my favorite also and i can never say no to those mediterranean flavors! What a great way to ring in the warm weather with this light salad! Shrimp is one of my favorite ingredients. This salad is so yummy! Waouh that is look good! I absolutely love the flavor combination of this salad! Quinoa is my favorite and looks so tasty with shrimp! Pinned! Perfect light salad. I love using Pompeian in my salad dressings! Hi Ashley! This salad looks absolutely delicious! Excited to have a new salad recipe to add to my summer list! :) Thanks for sharing and pinning! Love salad recipes with shrimp Ashley and this one has some amazing flavors going on! Pinned! What a great salad to make this summer! I love Mediterranean flavors and the shrimp added for protein is perfect. Pinning this to make very soon! This is just outstanding, Ashley!! OMGosh I want to dive right into those pictures. Pinned and sharing on FB now! Ashley this shrimp salad sounds delicious, can't wait to try it soon, it will be such an easy summer meal! What a great salad! I just got my pompeian flavors and I can't wait to make a delicious salad. This one is awesome. Thanks, Meagan! Pompeian flavors are the best. I love how many different salad combinations can be made with them! This looks amazing, Ashley! :) What a perfect and light dish for summer. Pinned. This salad looks amazing!! So fresh and bursting with delicious flavors. Can't wait to try it! I hope you get a chance to try it, Zainab! I love this salad!! The shrimp takes it to the next level! Thanks, Julia! I don't know what it is about warmer weather, but I love adding shrimp to spring/summer meals! Thanks, Natalie! The combination of Mediterranean flavors is the best!